IMPORTANT HOLIDAY SMARTPHONE WARNINGS!MICROWAVE RADIATION HEALTH HAZARDS!The kickoff for endless 2018 Black Friday and Cyber Monday Smartphone deals has begun. However, you need to know that several of the world’s largest studies have found links to smartphone radiation and cancer. Now, the newest study in the USA by the NTP (National Toxicology Program) found such alarming results that they released partial findings concluding a higher rate of two very deadly cancers. The complete results of the cell phone radiation cancer study mandated by the FDA has just been updated the NIH/NTP Website on Nov. 9, 2018, and has released final reports from the rat and mouse studies, and a newly updated fact sheet is available. For more details on this latest finding of “Clear Evidence of Cancer”. RF Safe issued two public awareness press releases. Some evidence of tumors in the brains of male rats. – The tumors were malignant gliomas. Some evidence of tumors in the adrenal glands of male rats. – The tumors were pheochromocytomas. A study National Toxicology Program has claimed this risk is greater for younger smartphone users that are the more prone to brain cancers, while those who use a mobile phone’s the longest face a higher risk of contracting a very deadly form of brain cancer. So before gift wrapping that new smartphone your child has been begging for — please read and share this important breaking news. The objective of this post is to keep you informed on the clear and present danger that exposure to microwave radiation poses to your family, along with showing you the best ways to mitigate health risks involved before gift wrapping a high-frequency microwave transmitter (smartphone) for your loved ones. Research published by Dr. Lennart Hardell indicates that brain tumor risk does increase with more years of cell phone use. The study identifies those with the most phone usage developed a 300% increase in brain cancer on the same side as their cell phone was most used. The official technical abstract of this study can be found here: http://www.spandidos-publications.com/10.3892/ijo.2013.2111. This further proves the negative health effects of cell phone radiation exposure are cumulative with more hours of use. Much in the same way as more hours of exposure to the sun’s harmful UV rays cause a higher risk of skin cancer. While it is true that ionizing radiation from our sun creates a much higher energy photon than its slightly less bio-active counterpart emitted from your Smartphone which is scientifically classified as non-ionizing microwave radiation — this lower energy also exhibits similar oxidative stress on biological processes through the overproduction of ROS, a very well known precursor for DNA damage and cancer. As shocking as it seems, many organizations supporting victims of brain tumors and those suffering from electromagnetic hypersensitivity have been expecting this official news in mainstream media for a long time. According to the Brain Tumor Foundation of Canada, brain tumors are the leading cause of cancer death in children under the age of 20. Statistics show brain cancer now surpasses acute lymphoblastic leukemia for cancer deaths in this very young age group and brain tumors are the third leading cause of cancer death in young adults ages 20-39. There are over 1,000 peer-reviewed scientific studies that link the harmful impacts of cell phone radiation to serious health problems which are not limited to cancer – neurological disease, immune dysfunction, disruption of the blood-brain-barrier, DNA damage, kills sperm which could lead to infertility, statistically significant neurological changes and cognitive disorders such as headaches, dizziness, tremors, decreased memory and attention, autonomic nervous system dysfunction, decreased reaction times, sleep disturbances, and visual disruptions to name only a few. In the likelihood that exposure to smartphone radiation is carcinogenic, research suggests Children ARE at greater risk! May 2011 Cell Phone Radiation Was Classified as Class 2B “Possibly Carcinogenic” By World Health Org. Dr. Leszczynski has played a very important roll in the world’s understanding of cell phone radiation health effects. Dr. Leszczynski was one of many scientists in a 31 member committee (IARC) constituted by the WHO. The results were 26 scientists among them classified radiofrequency radiation from wireless phones as possibly carcinogenic to humans (Group 2B), the group cited a link between phone radiation and brain cancer. About two years ago the Berkeley council voted to create an ordinance requiring cell phone retailers to provide customers with a handout indicating where to find the phone manufacturer’s recommended separation between body and phone. The warning alerts against carrying phones in pockets or bras while they are turned on as they can exceed safety standards imposed by the FCC. The city of San Francisco tried to pass a similar measure on warning consumers about cell phone radiation. However, a lawsuit filed by the wireless industry ended with a retraction of the proposal. To avoid such a challenge, the city of Berkeley worked with Lawrence Lessig, director of the Edmond J. Safra Center for Ethics at Harvard University, who provided his services pro bono to defend the consumers “Right To Know” about the inherent risk involved when using wireless devices. Just last month on Oct 11, 2017, the wireless industry failed again to end Berkeley’s Right To Know, and the ruling stands that consumers must be warned about cell phone radiation exposure. According to Joel Moskowitz, director of the UC Berkeley Center for Family and Community Health, the wireless phone industry has tried to suppress information about the health risks of cell phone use. He also cited data showing an increase in certain kinds of brain tumors close to where people hold their phones. Don’t Gift Wrap A Cyber Monday Smartphone Deal Without Smartphone Radiation Safety Accessories! Cyber Monday Smartphone Deals: RF Safe Cell Phone Packages Control Excessive Microwave Radiation Exposure. RF Safe has concluded that using a cell phone safely depends on a system of usage along with implementing the necessary shielding technologies. Safe Cell Phone Packages contain the most important RF Safety accessories to ensure maximum protection from cell phone radiation. Our packages address safe cell phone usage under many different real-world conditions, which provides our customers superior safety advantages over using an ordinary wired hand’s free headset or phone cases. Concern: Tests prove a cell phone headset wire can act as an antenna. Which could increase radiation channeled into a person’s ear canal. The test found the brain was subjected to 3 times as much radiation when a wired headset is used. 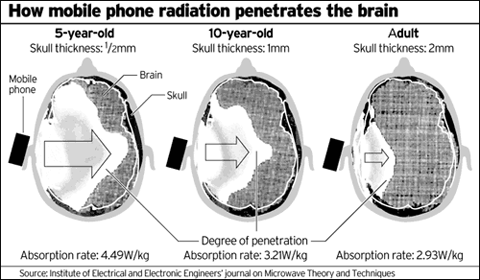 Concern: When a cell phone is placed on a belt or in a pocket or purse while using a hand’s free headset, this exposes many vital organs to high-frequency microwaves. Solution: The objective here is to simply place a protective barrier that deflects radiation between you and the Smartphone. 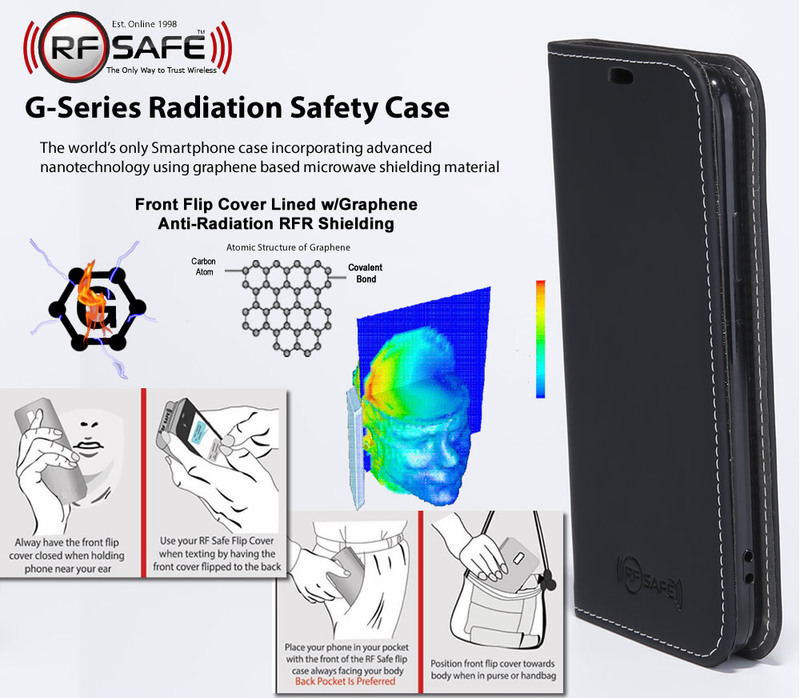 Designed by RF Safe, Peel-n-Shield is the perfect RF shielding suited for this purpose, available in either D-I-Y sheets or already incorporated into custom fit RF Safe cases for the most popular Apple iPhones and Samsung Galaxy smartphones. Ferrite beads are the most economical solution for shielding radiation from the wired hand’s free headset that came with your phone. Joel M. Moskowitz, Ph.D. School of Public Health, University of California, Berkeley posted a 1 page PDF Handout outlining “Some Tips to Reduce Your Exposure to Wireless Radiation.” Moskowitz wrote, “use a wired headset (with a small iron bead on the cord to prevent the cord from acting as an antenna).” Calling it a small iron bead maybe an oversimplification, as the “iron bead” he is referring to is really a semi-magnetic substance made from iron oxide (rust) alloyed with other metals that generally make up the composition of a ferrite bead. RF Safe has been offering ferrite beads for headset wires as an economical solution to radiation exposure for over 18 yrs. Studies have suggested that using a wired hands-free headset in certain positions may more than TRIPLE your brain’s exposure to radiation (the headset can act as an antenna that channels radiation into your brain!). Ferrite beads provide a simple solution to that problem. They do not block all the frequencies, but ferrite beads do limit unwanted high-frequency radiation, which can help decrease the effects of radiation on your brain.